The Global Volcanism Program has no activity reports for Falso Azufre. The Global Volcanism Program has no Weekly Reports available for Falso Azufre. The Global Volcanism Program has no Bulletin Reports available for Falso Azufre. The Falso Azufre volcanic complex is a 15-km-long, E-W trending group of overlapping craters, lava domes, and composite cones extending from Chile into Argentina. The western portion includes the high point and principal edifice of the complex, Cerro Falso Azufre, and consists of overlapping craters that produced dominantly pyroclastic products. The eastern portion, located wholly in Argentina, contains two small composite cones and two lava domes that appear to represent the most recent activity of the complex and may be of Holocene age (de Silva, 2007 pers. comm.). The Global Volcanism Program is not aware of any Holocene eruptions from Falso Azufre. If this volcano has had large eruptions (VEI >= 4) prior to 10,000 years ago, information might be found on the Falso Azufre page in the LaMEVE (Large Magnitude Explosive Volcanic Eruptions) database, a part of the Volcano Global Risk Identification and Analysis Project (VOGRIPA). There is no Deformation History data available for Falso Azufre. There is no Emissions History data available for Falso Azufre. 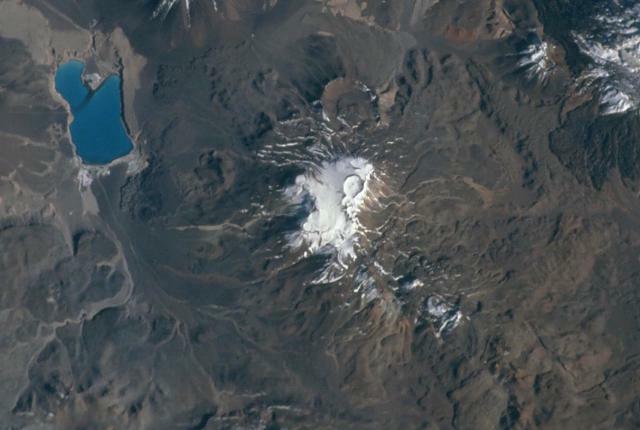 The snow-capped Falso Azufre volcanic complex rises along the Chile-Argentina border near Laguna Verde (upper left) in this NASA Space Shuttle image (with north to the upper left). The western portion includes Cerro Falso Azure, the high point of the complex, with prominent snow-covered craters. The eastern portion (toward the lower right) is located wholly in Argentina and contains small composite cones and lava domes (with lesser amounts of snow in this image) that appear to represent the most recent activity of the complex. There are no samples for Falso Azufre in the Smithsonian's NMNH Department of Mineral Sciences Rock and Ore collection. Large Eruptions of Falso Azufre Information about large Quaternary eruptions (VEI >= 4) is cataloged in the Large Magnitude Explosive Volcanic Eruptions (LaMEVE) database of the Volcano Global Risk Identification and Analysis Project (VOGRIPA).